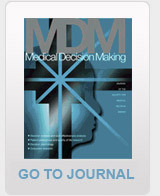 Ever since I was a PhD student, I found SMDM articles to be of high quality, balanced scientific treatment, and technically accessible. These articles have helped me in becoming more effective in my interactions with clinicians, and policy makers. Participating in SMDM meetings has been my inspiration to conduct and complete my research as I am confident that the scrutiny of SMDM will improve my future research outputs and methods significantly. "Through the SMDM network I have been in contact with SMDM members in Asia Pacific"